Alice points us to this awesome lecture-turned-flash-movie by Daniel Floyd. Well worth the few minutes to watch! I'd been meaning to post some thoughts on GTA4, but have been busy and have only played a couple hours into it. Since "anonymous" seemed to think my pointer to a flickr set of game screens was an endorsment, I guess I'd better do a short review/commentary now. While I'm at it, I spent an hour or so playing the Penny Arcade Game, so let's throw that into the mix, shall we? Pros: It's like GTA3, but bigger, badder and better. The world is huge, the content is racy, they've added a ton of stuff to the proven formula. Cons: It's like GTA3, but bigger, badder and better. The game, like many, is TOO BIG. Multiple hours before you even get to the moderately interesting stuff. Racy content is ok, but its gratuitous and they missed out on many opportunities to treat it more as gameplay rather than fluff. 'Better' as a con in that it's largely many incremental improvements over the proven formula of GTA3, but nothing revolutionary, and certainly not deserving of the over the top review scores. As many have noted, the metacritic scores are *out* *of* *control*. It's a good game, but it is not the perfect game by any means. There's a whole other post to write about the group think and pre-launch hype and resultant salivation that helps drive this behavior. As 'anon' commented, the game appears to push the DVD drive pretty hard, and some xbox's are having problems, something to do with dusty lenses? I saw the issue once, but then swapped Xbox360's (one of my had RROD'd and it came back from the fix-it shop) and haven't seen the issue since. The 'score with your girlfriend' potential achievement (ahem) is such a lost opportunity. Could have made a fantastic mini-game that you interact with through the game. Should you attempt to kiss her, take her upstairs, etc, with her reacting based on how long you've dated, what she thinks you'll think of her in the morning, how passive or aggressive you are being, how the current date was going, etc. Instead it's a little bit of gratuitous content and that's about it. Shame. The GPS and in-game phone are ok, but sometimes I think that games go too far to mask the HUD. I mean, really, are we all really fooling ourselves? I havent played multiplayer yet, but the multiplayer modes look like a riot. Waiting until I finish single player game. I've only played an hour or so this evening, but I was privvy to a little of the background while I worked at MS. There was a lot of heated discussion about whether the more-family-friendly XBLA channel was a good place for a game with a character that copulates with produce, but I guess we can see how that worked out, and I'm glad that it did. It's the closest I've seen to the reincarnation of Lucasarts point-n-click glory days. If you liked those games (I did), you'll be willing to put up with the turn-based-combat crap. As a comic put in motion, it's brilliant. Scott McCloud would be proud, I think. I love the treatment of fixed camera views as "panels", breaking the fourth wall. The toon rendering is well done, as is the panel treatment. Best comic-in-motion since Ubi's 'XIII'. Go try the demo, decide if it's for you, and buy it if it is. Its definitely worth downloading the demo. A while ago, I discovered Nau, a clothing store whose clothes I really liked and who's mission was pretty cool. Then the other day I discovered they were going out of business despite being less than a year old. Crappy crap. The unique thing about their business seemed pretty well timed, "style with meaning" I guess you'd call it. Things like a portion of your purchase going to a non-profit group which you chose at time of purchase, clothes made from sustainable or reclaimed materials, low-impact biz practices, etc. See here for more detail. The (somewhat bitter sounding) statement on their website claims investor reluctance, but I can't beleive that's the whole story. There's a ton of VC interest in other environment-related companies right now. Maybe it's the direction the economy is taking that has them reluctant about boutique clothing? I dunno. Anyhow, rest of inventory is on sale on their website. I went and busted the bank, you should too. They'll be rareties soon enough! 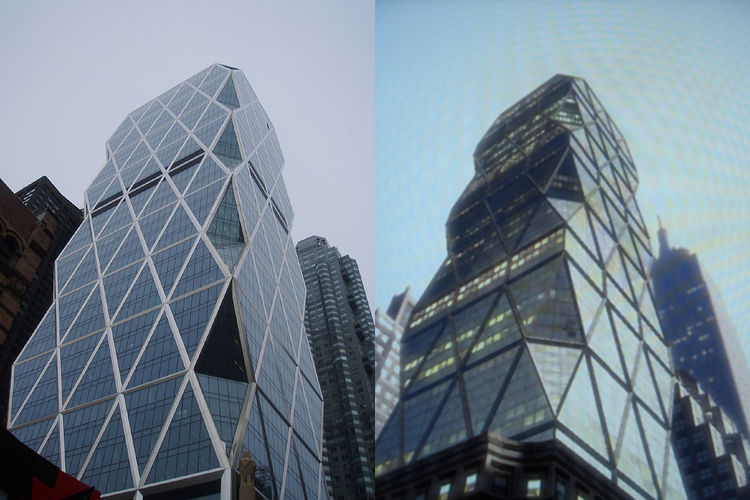 Awesome flickr set of side-by-sides of GTA4 screens and NYC pics. Man, People are *shippin* stuff! Dave's book is done. Congrats Dave. I remember finishing GPG5 and handing off the huge printed stack. Fun. Robin (and a cast of others) shipped Boom Blox, and it's rockin' 85 on metacritic. I guess I'll finally have to buy that Wii. Justin & Merci (who's game has been in beta for a while), shipped PMOG, the Passively Multiplayer Online Game. Things have been busy between work & settling into the new house. Work's also involved some travel. Did a few days in San Fran for work-related meetings, dinner with Chris, lunch with... well, no one talks about Fight Club. Montreal last week for 3 days which was fun, but tightly packed. Work related meetings and dinners, tons of work to do in small gaps of time between, and then one afternoon of visits with mom, dad, friends. Flew back 6:00am Saturday to attend Adam & Stacey's wedding party. Hopefully should catch up now that I am stationary (I think?) until GDC Paris.